Happy New Year! I know this post is a little delayed, but the sentiment is still true. I am so happy to be starting a new year. 2014 was not the best year for our family, between cancer news, car accidents, impromptu kitchen repairs and a number of other bumps in the road, I am happy to say goodbye to 2014 and ask the powers greater than me that 2015 bring us more blessings, health and happiness. I know that life will always bring struggles and challenges, and how you deal with those issues is what makes you stronger and more resilient. I also know that we are still very fortunate for all that we have and things could always be a lot worse. But when you have stress – no matter what it is, that stress is equal to any other stress and needs to be managed in a healthy way. My hope is that 2015 is a year of healing, planning, purging and getting ready for our next adventure. In my last post I said I would report weekly about how the planning for the trip was going – that was a lofty goal, considering that we had a lot going on over the last few months and although we are constantly planning and thinking about the trip, the main steps we are taking to get ready are mainly purging our house of things we no longer need and getting the camper ready for the trip ahead. The next few months will be really about getting our house ready for renters. The first step is replacing the floor that was removed for water damage throughout the kitchen. Removing everything from the kitchen definitely brings an element of chaos to the house, but it is also a great opportunity to get rid of the stuff we don’t use and practice eating and making dinners in the camper. Life is not always easy, and I know there will plenty more challenges along the way, but the way we handle them is what will keep your sanity. Until next time, friends, thanks for reading! 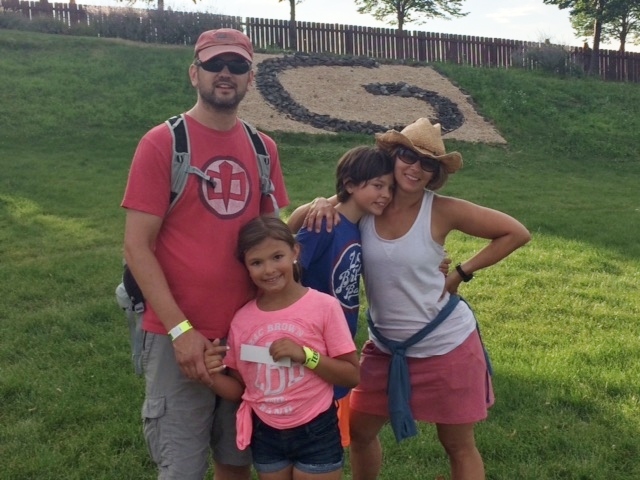 Over the past few months, our family has been talking about our summer trip – which ended up being named “The 3-Week Trip”, Andrew and I had a lot of planning to do, what to bring, where exactly we would be going, what we needed for the camper, etc. Whenever we talked about it we called it “The 3-Week Trip”. After months of talking about it, the time finally came that we got to pull out of our drive way and set out on “The 3-Week Trip”! 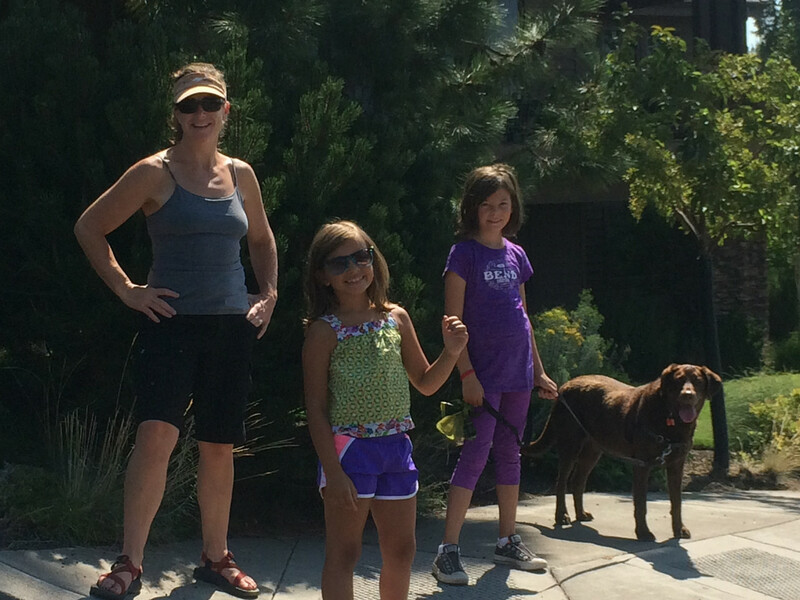 Our first stop was Bend, Oregon to visit our good friends Tom & Lisa and their dog Ruby. 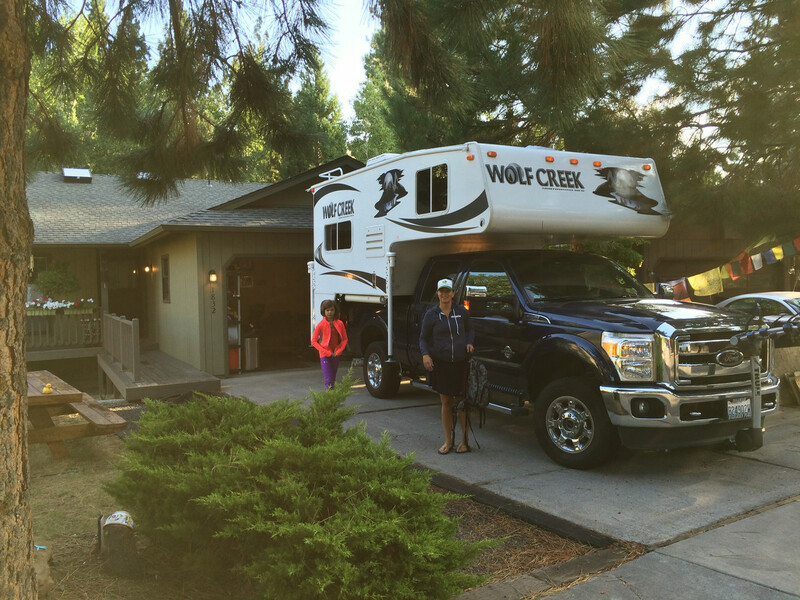 We parked Wolf Creek in the driveway and took the bikes off the front of the truck and got busy in Bend. We rode our bikes everywhere, to dinner, to the park, to the river and all the spots in between. 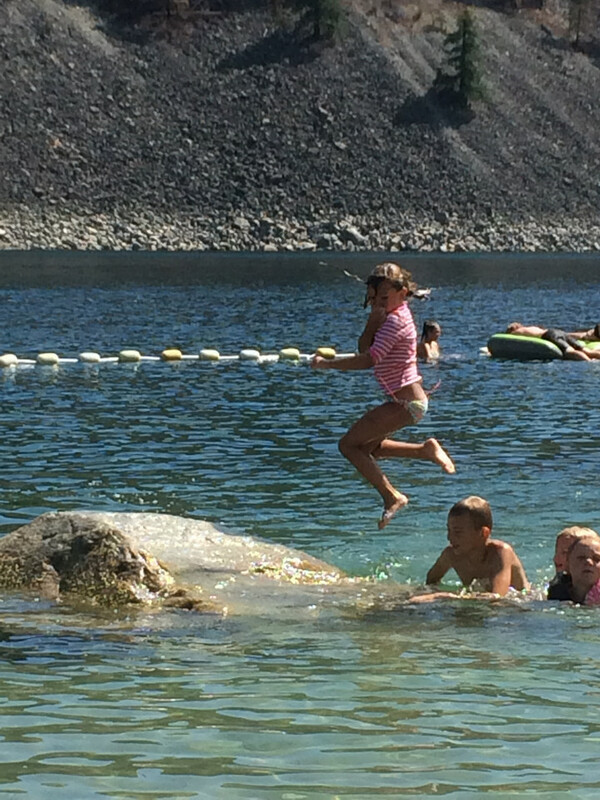 We had a great time paddling and floating down the Deschutes River in the sunshine. It should be noted, this is not a simple ride down the river, you do need to have a little skill and be aware of what is going on around you, at one point on the river you need to exit at the Colorado Ave bridge, if you are not watching the signs you could get into serious trouble and head into the portage. Andrew found this out the hard way, from his paddle board, he skillfully helped a family from disaster and helped them get to safety. We also enjoyed some lovely meals in Bend. While Tom & Lisa were kind enough to make lots of snacks, dinner and breakfast for us, one night we went out and rode to an awesome food truck pavilion called The Lot.This place was great, it had something for everyone, there are about 8-10 food trucks surrounding a covered patio with a bar in the middle! Perfection! We all got what we wanted, didn’t spend too much money, it was lovely. After 2 nights in Bend we were off to our next stop. 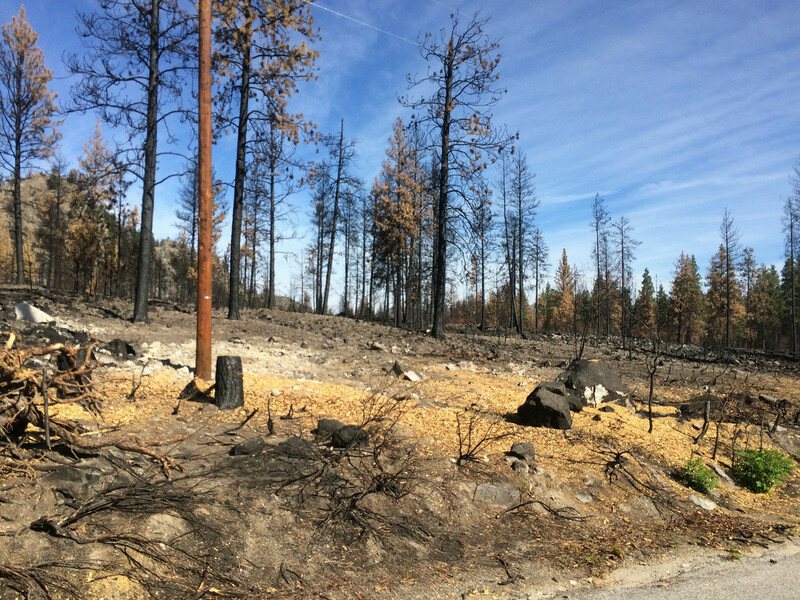 We headed to South Lake Tahoe to a place called Camp Richardson, on the California side of the Lake Tahoe. One thing we did realize on this trip is that driving time in the camper is a lot different than driving times provided by Google Maps. We found out that when Google says it will take 7 hours to get somewhere it will really take us about 9-10 hours, as the trip went on we made the adjustments and determined that on our next long road trip driving times will be much shorter and staying times will be longer. When we finally got into Camp Richardson after about 9 hours on the road, we were greeted by a huge thunderstorm (which made getting the paddle board on the roof a little tricky), but we couldn’t let it keep us in, we needed dinner so we set off in our ponchos to the restaurant and had dinner in the historic Beacon Bar & Grill. The next day the sun came out, in the morning we rode our bikes into town to get groceries for dinner and in the afternoon we were able to play on the water. Andrew and the girls rented a jet ski, while I paddled around the lake. 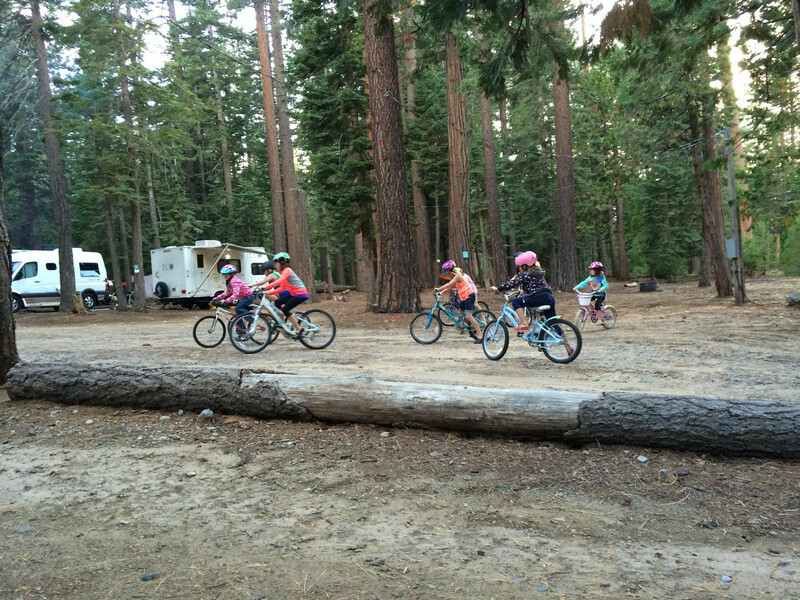 We enjoyed dinner at the campsite that night and the girls made friends with the other kids on their bikes. It was a great sight watching the kids bike around with other girls from Nevada & California, they had fun checking out other kids campers, making plans to meet up and exchanging addresses to be pen pals. One great thing about being away from home for awhile is that the kids learn to break out of their comfort zone and explore new things and meet new people. We spent 2 nights at Lake Tahoe and then we were off to the Grand Canyon, another super long drive — seeing a trend yet? After this long trip, we learned no more driving at night. Setting up at night, even in a camper is tricky, but we made it to the North Rim without hitting any wildlife (thank God and super driver Andrew!) and rested up for a great day at the Canyon. 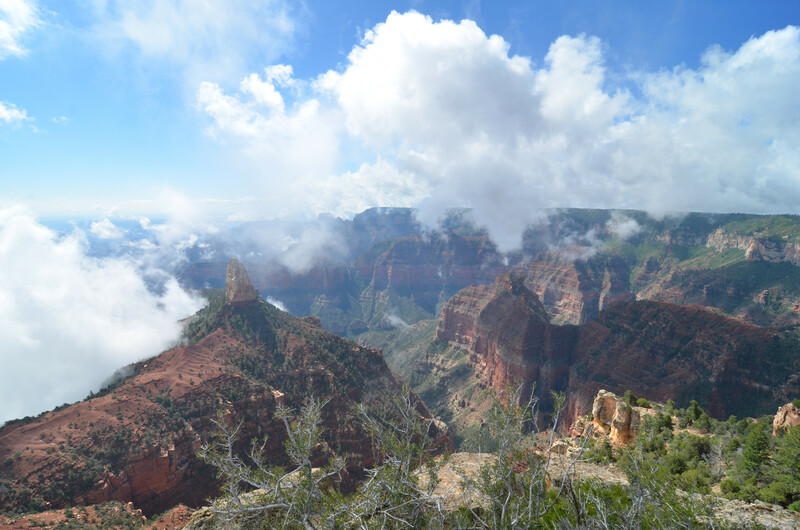 In the morning we got up and headed to Point Imperial, the highest point on the North Rim at 8,803 feet (2,683 meters), overlooking the Painted Desert and the eastern end of Grand Canyon. 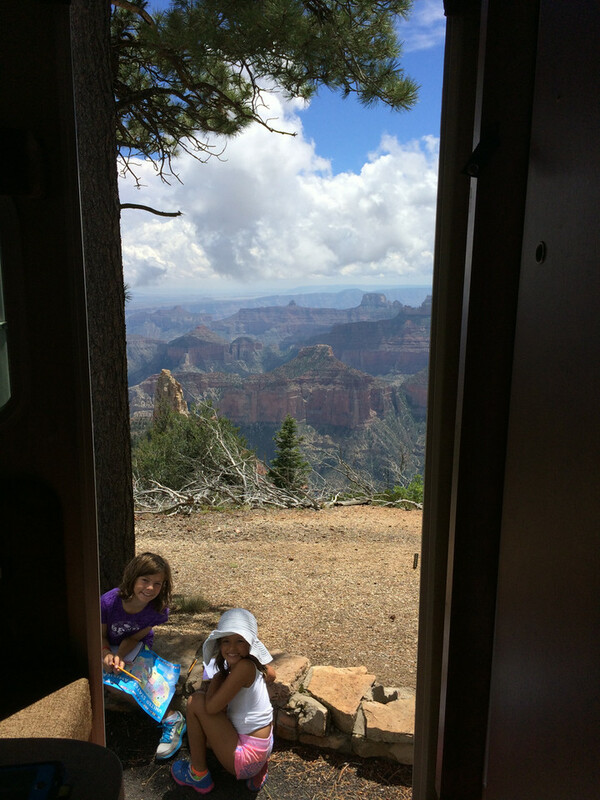 We hiked one of the rim trails for a couple hours and then had lunch in the camper, overlooking the Canyon. For me, this was one of the highlights of the trip and one of the things I love about having our camper. Being able to have all your stuff right there is so convenient and made lunch a great experience. After lunch we explored the North Rim lodge and listened to some great Ranger Talks. The next day we took a tougher hike down into the canyon. 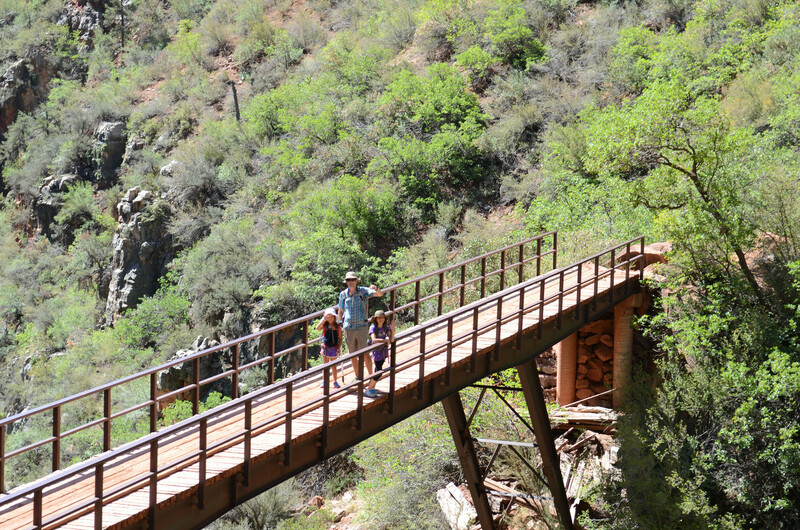 We started at the North Kaibab Trail, headed down past the Supai Tunnel into the Roaring Springs Canyon. We turned around at the bridge that was recently built and headed back up, overall we hiked about 6.5 miles – we were super proud of the girls. It took about 2 hours to get down and only 2 hours and 15 minutes to get back up. They were super hikers! After the long day of hiking we had lunch at the North Rim Lodge and then decided to get on the road so that we could break up our 10 hour drive to the cabin in New Mexico into two days of driving – instead of one long day…see we’re learning! We did a little cheat here and ended up in a hotel in Farmington, NM. We were going to find a place to camp but with the camper packed with the paddle board, bikes, a bbq and much more, we couldn’t really boondock it with all our gear. We enjoyed clean sheets, fresh showers and a free breakfast! And were able to get on the road early and were able to see family in Eagle Nest in the early afternoon. 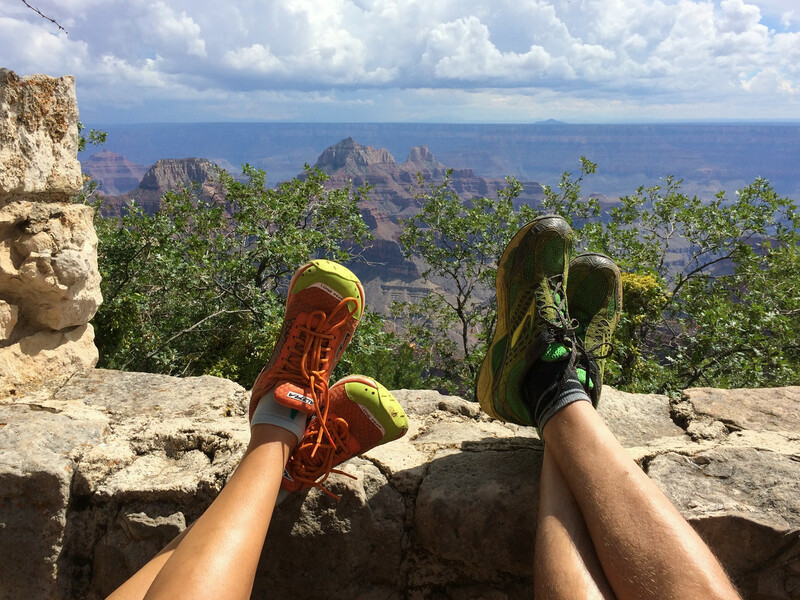 Relaxing at the North Rim lodge. Super hikers made it to the bridge! We stayed in Eagle Nest for five days, this was a great time to visit with our family, do some laundry, sleep in real beds and spread out a bit. The first night we headed into Red River with cousins Jon & Monica and watched the two-steppers at the Motherlode Saloon. Andrew and I learned that we are not two-steppers and probably shouldn’t try again until we take some lessons. We spent a lot of time in Red River and Taos. The highlight of this trip was by far our hot air balloon ride with Eske’s Paradise Balloons. 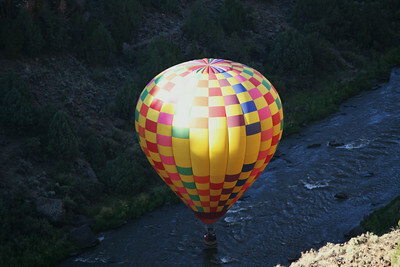 We started the morning by taking off in a hot air balloon at sunrise, touching down into the Rio Grande Canyon and then enjoying a champagne breakfast on the river. Absolutely amazing and breathtaking views. 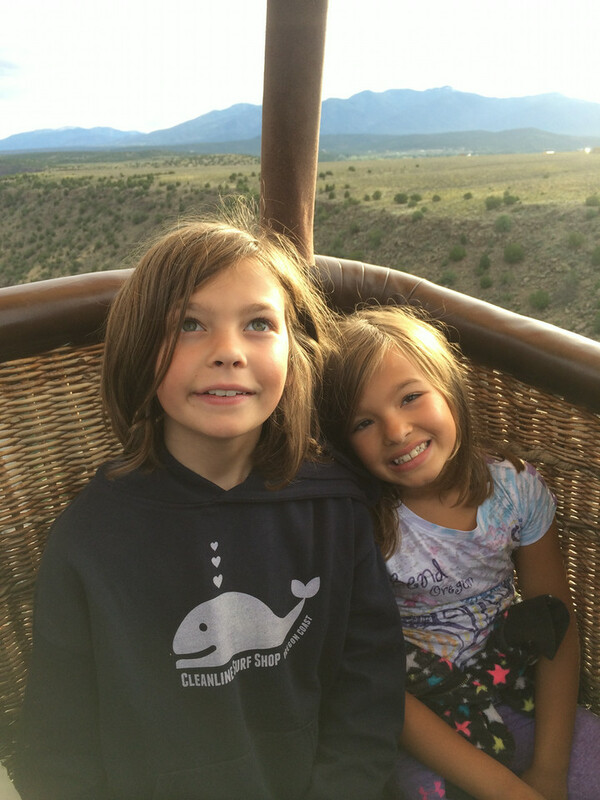 I love hot air balloons and in our past trips to New Mexico we have watched the balloon rallies, and always talked about going up in one, but thought the girls were too young. This trip they were old enough and it was AWESOME! Girls in the balloon basket. We had a great week at the cabin but had more of the Western US to see, on this trip we ended up going through all of the Western US states (except for Texas). 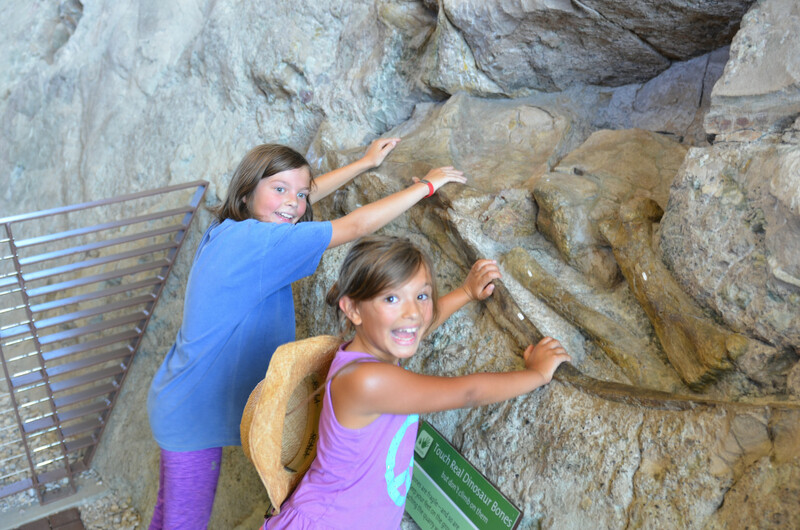 The next stop was Dinosaur National Monument. This ended up to be the favorite spot for both the girls on the trip. 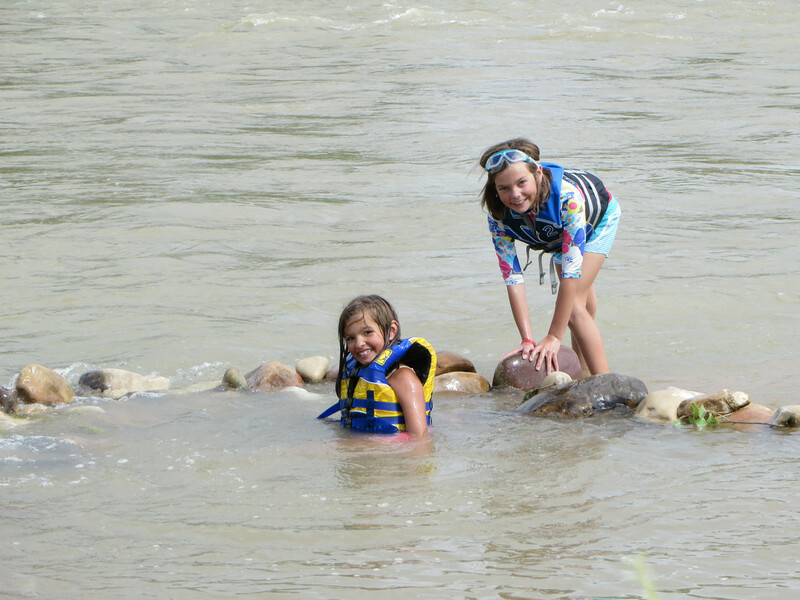 The campground near Green River was great, we were close to the river, there was huge hill for the girls to climb and run down, we played in the water, hiked and explored all the amazing fossils, dinosaur bones and Petroglyphs. The Quarry Exhibit Hall was extraordinary, it was fascinating to see all that has been discovered in this part of the country and it was fun to imagine what it must have been like millions of years ago. Bison ready to charge across the boardwalk we were on! huge animal and it was moving very fast. 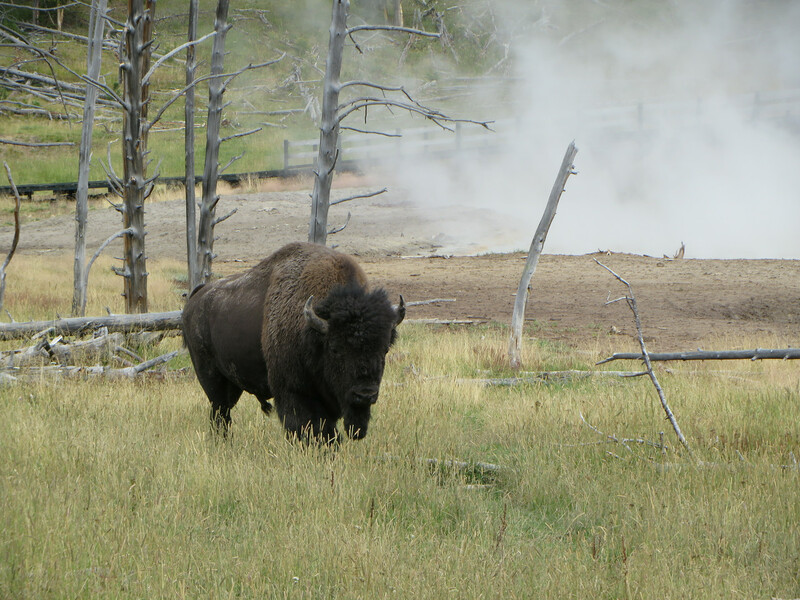 Andrew was not pleased that our family was not all together when the bison was moving, but in my defense, I did not want to get in front of it, so I stayed put (but I may have been taking a few too many photos prior to the running of the bison). Another learning moment. 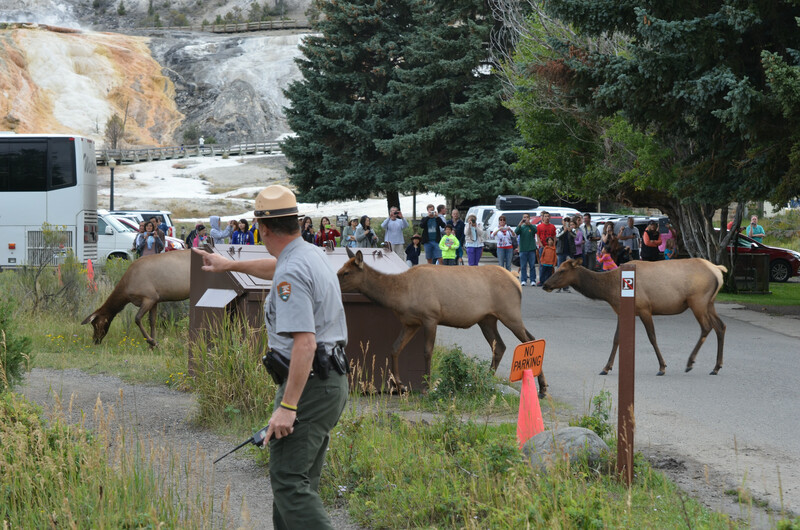 From the bison experience we knew it is safest to stay together, so when we were crowded by tons of elk in Mammoth Hot Springs, we stayed together as a family and let the Park Rangers tell us where to go and how to stay out of their way. And we still got some great photos! 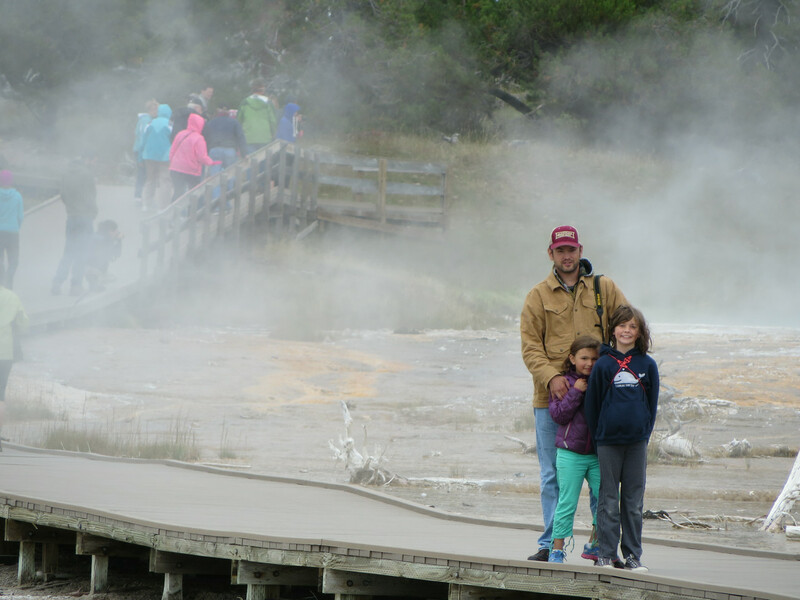 We left Yellowstone late in the day and headed out for a short drive to Bozeman, MT, where we planned to stay a couple nights with my brother Dan. Since he was working that night we planned on eating at Dave’s Sushi, where he is one the sushi chefs. We sat at the bar and had Dan whip up whatever he felt like for us, with a few requests from the girls. The mango cucumber roll was a favorite! The next day we headed out to the Hyalite Reservoir. This little gem is only a few miles outside of Bozeman and college kids and families come to picnic, hike and play on the water. We had super fun day paddling with Uncle Dan and hanging out on the water. We really wish we had more time to hang out in Montana, but our trip was coming to an end and we had a few more stops on the way home. After a home cooked dinner with Dan and his friends, we hit the road again the next morning. 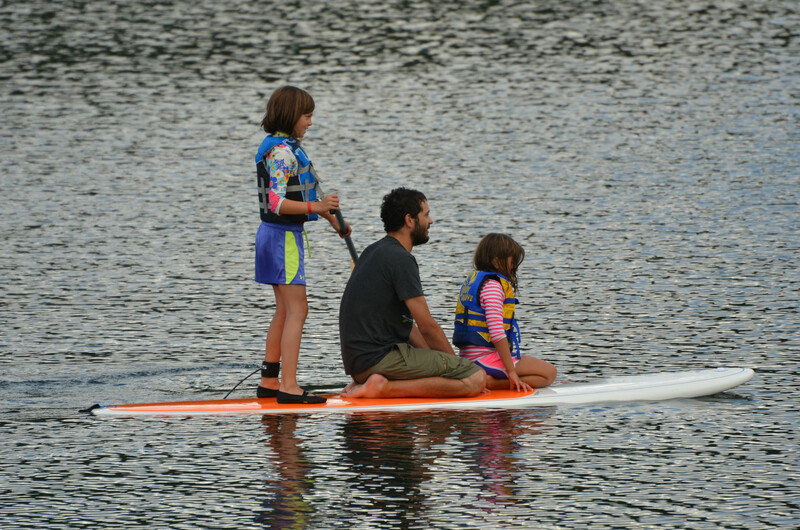 Girls paddling with Uncle Dan. hottest at Alta Lake than it was anywhere else on our trip, the day we spent on the lake it was almost 90 degrees! Which made it great to sit on the beach, paddle, play in the water and slowly prepare for re-entry. Our last stop on the trip was Lake Chelan. 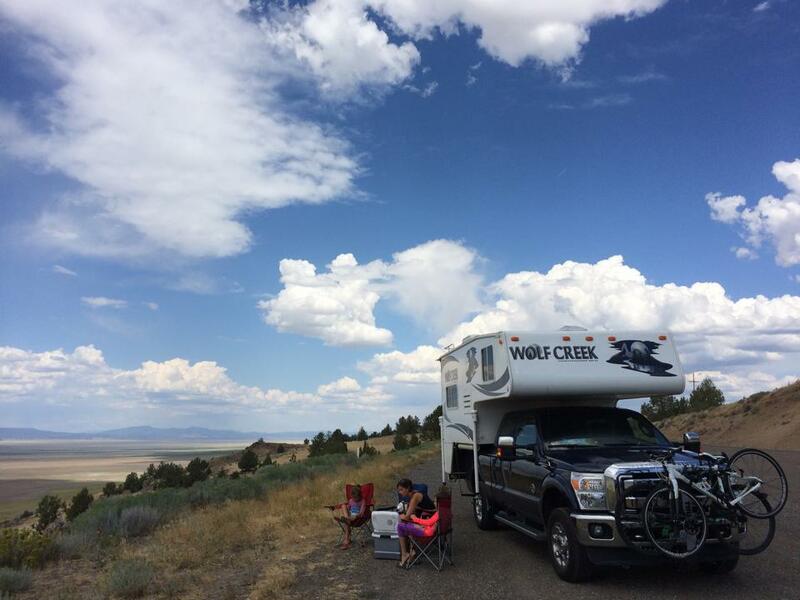 We took a family vote and decided that we wanted to see another new town and park, so we took a gamble and checked to see if anyone may have checked out early at the Lake Chelan’s Lakeshore RV Park – we got lucky! Although you generally need to book it 9 months in advance, when people go home early, we got a spot! 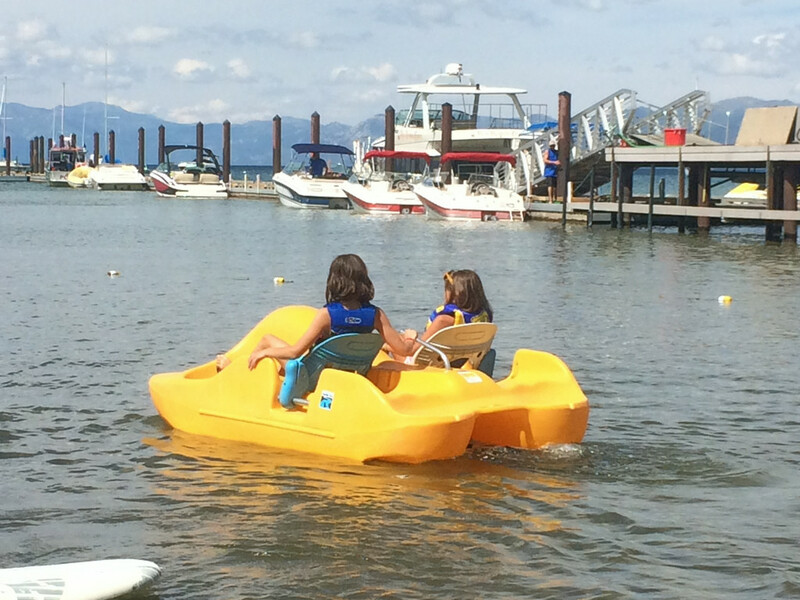 We spent our day in Chelan biking to lunch at Campbell’s Resort and then on to Slide Waters water park – this was the girls choice and we figured they had been such super campers over the whole trip, they got to have their choice of activities that day. The next day we got up and had to head home, we decided to make one more fun stop in the town of Leavenworth. We had a yummy lunch at Icicle Brewing Company, bought fudge, nuts and fancy olive oil to take home and then we made the super short drive (just 2.5 hours) home. Coming home was bittersweet, we had tons of laundry and gear to put away, but it was great to get back to familiar faces, sleeping in our own rooms and falling back into a normal routine. The girls are back at school now, which is the only way I would be able to get all these thoughts down in one day. And now its on to thinking about the next big trip. I just bought my wall map of the US & Canada so we can plot out where we will go next! Thanks for reading, hope you enjoyed our adventures. We certainly have! 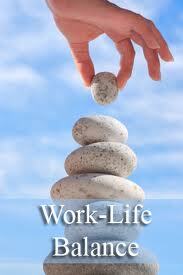 Work Life Balance – Can We Have It All? Yes, I admit, having it all is a little extreme – but I don’t think wanting to have a balance between your work life and your real life is too much to ask. This conversation comes up in the midst of Yahoo!’s CEO, Marissa Mayer, announcing to the company that employees will no longer be able to work from home. I, like many others, find this news upsetting and honestly very surprising. This 2013, we have an amazing amount of technology in the world that allows us to communicate and do business with people on the other side of the planet, yet, we need to have butts in seats at the office. I have worked in many offices that were also passionate about “face-time” which is one of the main reasons I am now working for myself, from the comfort of my own home. What this sounds like to me, if I was a Yahoo! employee, is that Yahoo! really does not trust their employees anymore. Or maybe one or two bad apples spoiled it for the rest of them. It would seem to me that if employees are getting their work done and being proactive in their jobs, why change a good thing? I have another question for Mrs. Mayer: Now that employees will be full-time in the office, will they now be providing compensations for their employees child care costs or other expenses that will be incurred when they are back in the office full-time? Maybe they will be opening a Yahoo! daycare on site so that everyone can bring their children into the office, like Mayer does. The problem that upsets me most about this story is the fact that Mayer obviously understands the importance of the bond between mother and baby, raising children yourself and having quality time with them, yet she doesn’t want to pass on that flexibility the rest of the company? I am only focusing on one area of why people work from home, which is childcare, obviously this is an issue for me. But I am certain there are plenty of other reasons people work from home, caring for elderly parents, saving time and money on the commute and gas prices. Working from home also allows some the ability to focus without distractions. In an office of hundreds of people, you may get pulled into meeting after meeting, and have no time to get that one project done (especially if you have to leave at certain time for other responsibilities), being able to work remotely will allow you the ability to focus and get it done. I also wonder if this new announcement will work the other way too, since no one is going to be able to work from home, does that mean no emails, calls or work will be done after work hours? Once that bell rings 5pm, everyone will punch their time cards, put their smart phones away and not have another thought about work until 8am the next morning. Is that really what they want? Don’t those folks in Silicon Valley work with people overseas and on other time zones… sorry can’t get back to you until the morning, we don’t work from home! Clearly, my blog post on the issue will not change anything over at Yahoo! but it does validate my position on being a part-time, work from home, mom. Although I have days and weeks that I feel frustrated and doubtful that this was the right choice. Maybe starting my own consulting business and trying to become a writer are lofty goals, but the main reason I chose this path is because I wanted to call my own shots. I want to do the work that I am passionate about and I also want to go on my kids field trips without having to ask permission. Right now I am learning to balance it all out, I may have to get up at 5:30am so I can write, but that also means that I am able to walk my girls to school and pick them up and I will fit in my work in between, before and after, because that is what has to work for me. I think it is sad that a lot of companies today can’t understand that giving employees a bit of freedom and flexibility will help both the company and the employees in the long run. By trusting your employees to do their job, no matter how they get it done, will keep them around longer and become more loyal to a company that is also loyal to them. A site focused on bringing attention to issues and topics that are interesting, important and worth sharing.